I'm really getting stumped on the disparate sizes of potential mutant animals, with characters potentially ranging in size from smaller than mice to larger than elephants, how do we address the issue of characters hitting varying sized characters (and the respective damage their might do)...and when I do this, how do I keep it from getting too crunchy when the rest of the game is predominately narrative in spirit. At this stage I'm thinking of allocating a limited "size class" mechanism. Each character has a size class from 0 to 14 (typically), where 7 is a regular human (50-100kg, 1.5m-2m) and every increment basically halves or doubles the weight (and modifies height by about 30%). The whole system is logarithmic. One of the reasons I love roleplaying games is the ability to get into different headspaces. Forget different races, different cultures are more interesting, different forms of morality that underpin the actions of a character. This is one of the reasons why I like the Sabbat in Vampire: the Masquerade. They don't bother pretending to be human anymore, so they adopt new methods to transcend their humanity and the beast that gnaws at their soul. For this reason I'm thinking of including a crude morality system in the mutant game "Other Strangeness", something that mechanically makes players think in a non-human way. These characters aren't human, and many players I've encountered in conventions (and ongoing LARP chronicles) over the years don't really understand the way to get into an inhuman mindset...but mechanical prompts help a bit. Such mechanical prompts may seem a bit forced at times, but they do their job. 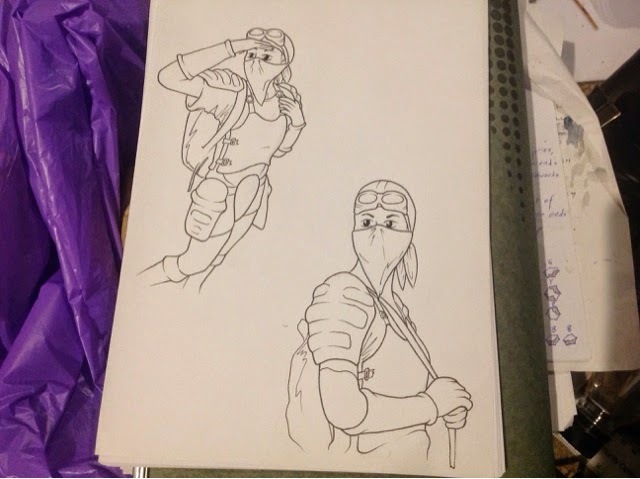 My post apocalyptic scavenger has been through a few more refinements today, and I think I'm getting closer to something that might be workable. There will be a bit more tweaking, perhaps playing with proportions a bit to get a more manga/anime vibe. Maybe playing with shading techniques. We'll see how things develop. The story takes place in the world of "Walkabout". The premise behind this character is a scavenger of non-descript gender who does steretypically "male" things, like rescuing the "macho soldier in distress", it's only at the end of the book that we see this character is in fact female. 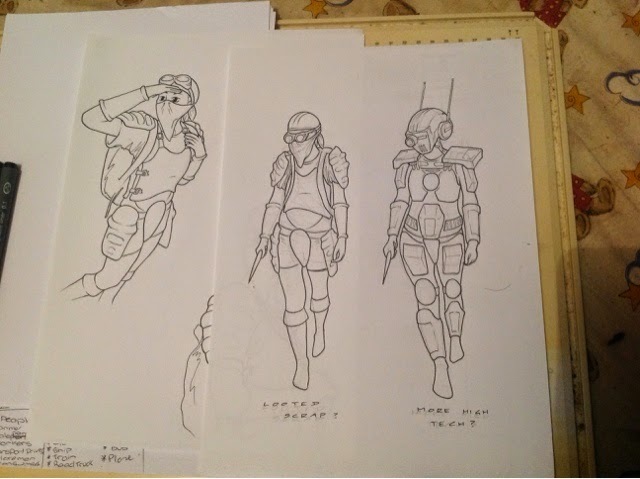 ...the following are some more concept sketches. It's clear she needs more belts, webbing, storage packs, and other padding to bulk out her frame and cover up the curves for this to work. On the other hand, she needs to be quick, agile, and combat ready in the story. What gender is this character? This is a combination post, describing how geomorphs might be appropriate to use in the Vulpinoid Studios game "Voidstone Chronicles". In the 12th part of this series we looked at ways to break a larger hexagon into smaller hexes, and this is basically how I generate quick battle terrain for Voidstone Chronicles. 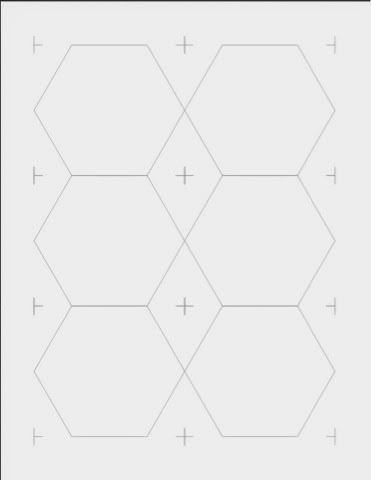 Two or three large hexes are put together, one or two of these might have a hill (either in the middle, at the middle of an edge, or focused on the corner of the hex). This gives us four possible phases ("plain", "left hill", "right hill", or "mid hill"). I've set up a Patreon to help earn a bit of extra money and further the cause for mapping work across the internet. This is basically structured into two levels, digital backers and physical backers, and for the moment will basically focus on sets of geomorphs. I've looked at a few other patreon pages and think that the prices I'm asking are fairly reasonable, but we'll just have to wait and see. I think this is the link, please let me know if it works. I'm hoping that once geomorph sets have been produced for the Patreon, they will then be made available for sale through RPGNow (as digital copies) and The Game Crafter (as physical copies). Those people kind enough to support me through the Patreon will simply gain earlier access to the map fragments and have the chance to determine which maps sets will come next. All this talk about geomorphs is no good if the theory isn't put into practice. This week I'm hoping to release two sets of geomorphs over on the Vulpinoid Studiios RPGNow webstore. Each will be a three-phase system, and each will have around 30 hexagonal geomorphs. 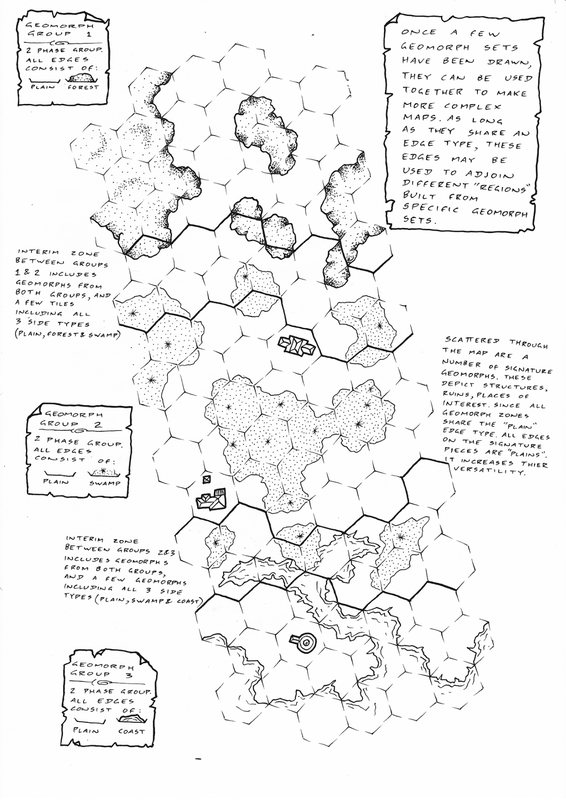 The sets will each comprise an uncoloured set of 30 inked hexes, and a coloured set. In hyperbolic marketing speak, that's 60 tiles per set. A general landscape set (with the three phases "open plain", "road", and "forest"). 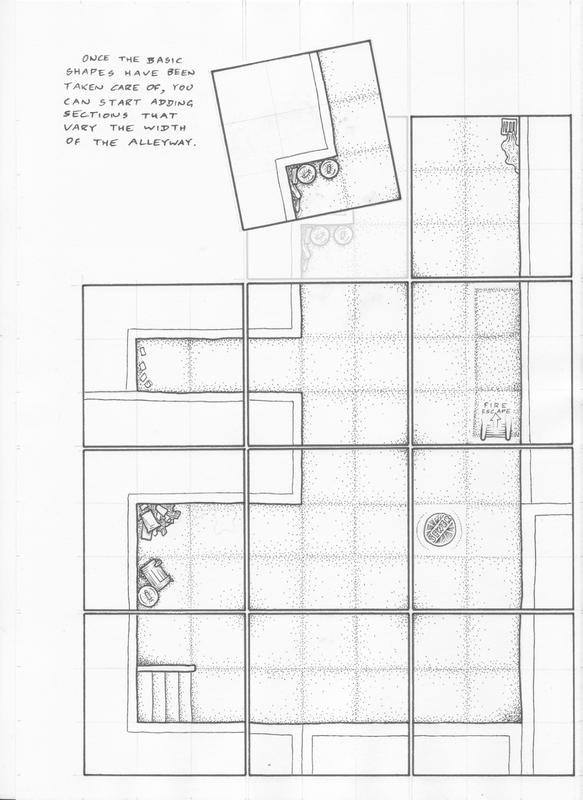 A subterranean set (with the phases "open space", "passageway" and "rock"). I hope they sell well, I've got a few bills to pay at the moment. Still needs a lot of work, but might be the start of something. 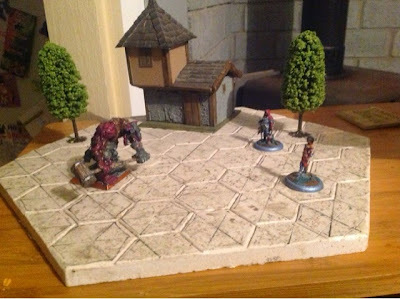 Geomorphs don't have to focus on wide sweeps of landscape, they can just as easily be used to model small locations...perhaps the specific confines of an encounter, a dungeon room, an alleyway, a passage with traps. I was actually asked about this when I first started the series, but I figured that it was necessary to lay some ground rules and background information first. There was a recent kickstarter where geomorph tiles were offered (I'll provide a link here as soon as I find it). That basically worked with these ideas, but I like a bit more detail in my geomorphs. 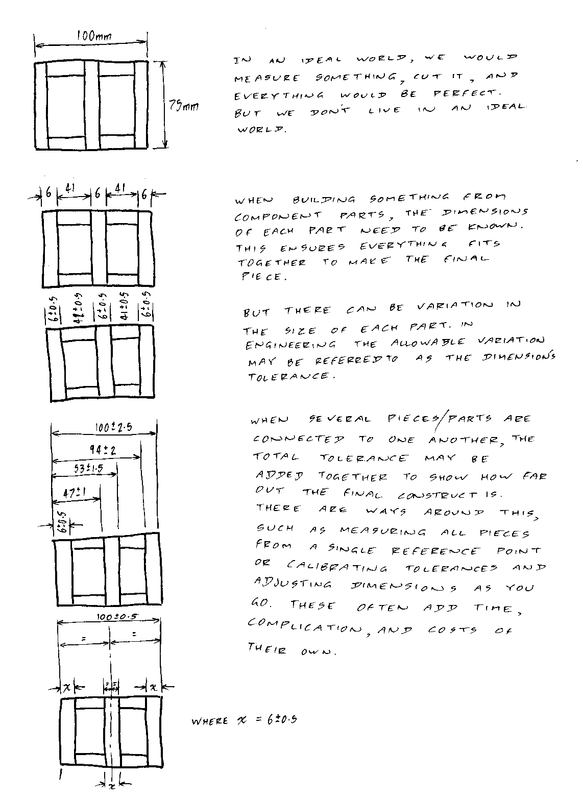 This system is basically four-phase "open space", "building", "left wall", and "right wall". Once you decide to add in varying widths of alleyway, you add in two more phases "narrow left wall" and "narrow right wall". In assembly, like the swamp geomorphs indicated earlier, left wall sides can only match up with equivalent right wall sides. There was something interesting that I noticed about the work of Keith J Davies yesterday. 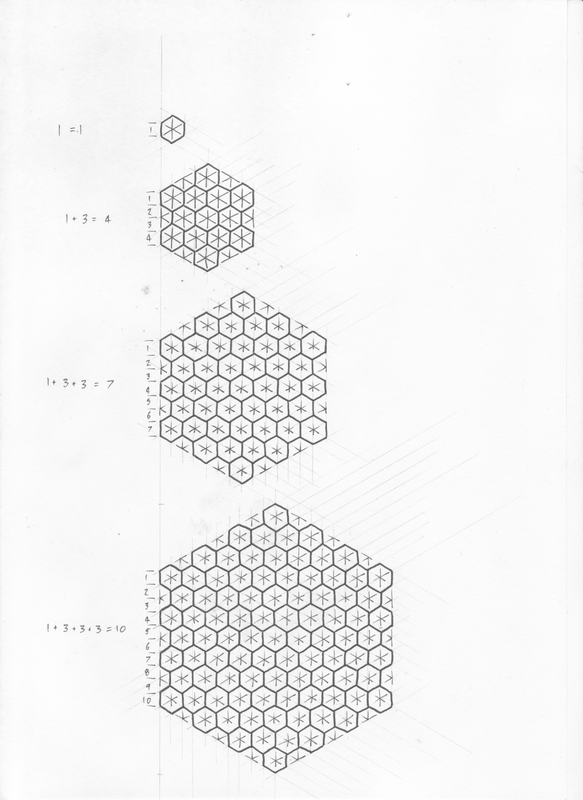 He divided the edges of the hex into tenths, then drew the isometric grid across it from these points. 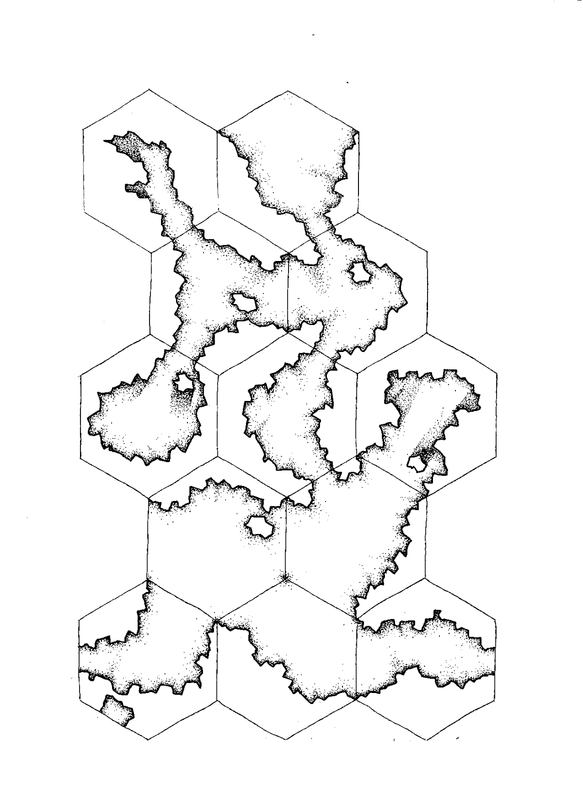 That's really interesting from the perspective of splitting a hexagonal geomorph into smaller geomorphs or building a larger hex from smaller hexes. Basically, to do this effectively you need to divide the sides into a number of fragments equal to "one plus a multiple of three" (eg. 1 + 0x3 = 1, 1 + 1x3 = 4, 1 + 2x3 = 7, 1 + 3x3 = 10). Here's an illustration to show what I mean. It's not a specific element of geomorph design, it's just something to consider when it comes to scaling geomorphs (whether dividing larger geomorphs into smaller forms or combining smaller geomorphs into larger patterns). The fact that the 10 to 1 ratio makes things easier for those of us using metric is just a bonus. One of my future posts has been pre-empted by the work of Keith J Davies. It's great to have been an inspiration to someone, and it's good to see things being taken further. I've got a lot of projects on my plate at the moment, so I can't churn out these tutorials as quickly as I might like, but it looks like Keith is generally on the same wavelength as me, especially over a few of the online conversations we've had in recent days. 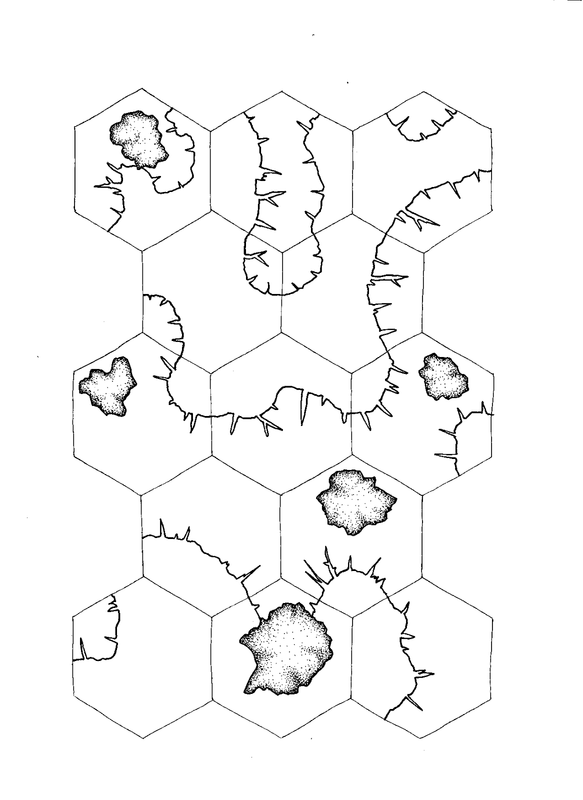 I was going to leave it a bit further down the track, but I'll start looking at the actual drawing of geomorphs now. We've touched on edge types and phases for geomorph systems, but one of the key things about drawing geomorphs is making sure everything is consistent and lines up when the tiles are placed together. If two-phase geomorph systems seem a bit constraining, three-phase systems start to seem a bit daunting, and four-phase systems are just a nightmare in complexity waiting to beat your brain into a gibbering heap...what about single phase systems? If you're thinking to yourself... "Surely you can't have fun with a system of geomorphs where every side is the same?" ...you'd be wrong. Single phase geomorph systems are arguably the most versatile of all, because it doesn't matter which geomorph edge sits next to which other geomorph edge. No problems with land abruptly meeting sea, no problems with "right banks" being forced to join up with "left banks". They all fit together neatly because they are all the same. But this means you need to design your complexity within the confines of the single tile. It might be a swamp, like the marshes that Gollum leads Sam and Frodo through after the fellowship of the ring breaks up. It looks pretty simple, and could probably do with a bit of colour, but it's basically a specialised three-phase system...and there is a degree of trickiness in its execution that you have to be careful of. Geomorphs have a great deal of versatility. Many of the depictions so far have been urban or above ground, but don't let that be a limitation. They can just as easily depict underground caverns and dungeon complexes. This particular example is a three-phase system. The edge types are "rock", "passageway" and "opening". You could easily get away with developing an underground geomorph system by using only a two-phase system with "rock" and "passageway" edge variants, and there would certainly be a wide variety ofoptions possible with such a system, but I've included the "opening" option because it allows for much larger cavern spaces that extend beyond the borders of a single geomorph (this can be seen most clearly in the bottom of the map where three adjacent tiles have "opening" edges connecting them. This can be seen a bit clearer when a bit of colour and texture is added to the geomorphs. A working computer and scanner...that means it is time to get back to work on the geomorph sequence. A lot of the discussion in this set of tutorials has been focused around square geomorphs. They're the easiest for most people to wrap their heads around. But my preferred form of geomorph is based around the hexagon, these tend to produce more organic and interesting shapes. This is true for natural environments, but it's no less true for urban environments. The example set of geomorphs above as a simple two-phase system. One edge type is plain, the other edge type has a road piercing the centre. 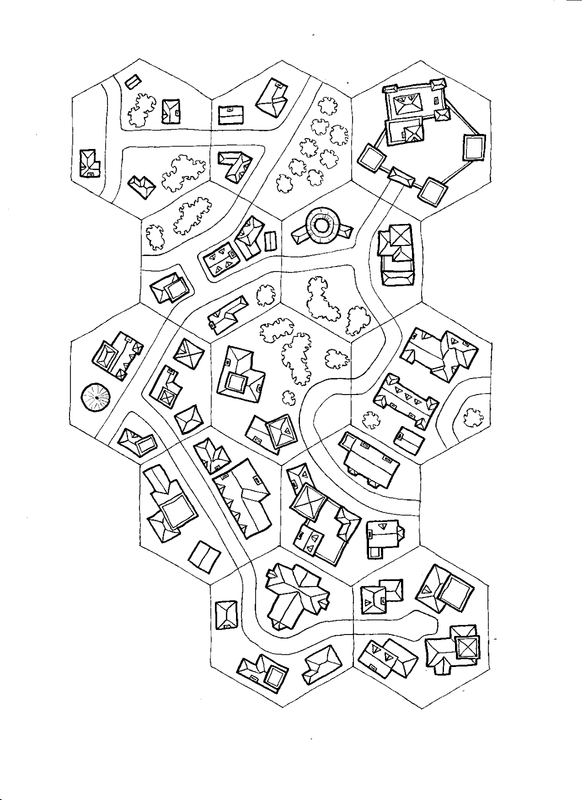 There could be dozens of combinations and permutations for each of the two phases around the hexagonal edges, but a quick look at the variety of buildings and road shapes shows that there could literally be hundreds of possible options when drawing these map fragments. This post is testing a theory...I can upload the map with my laptop and type in the text with my iPad. The general idea here is that you can build complex maps from simple sets of 2-phase geomorphs. 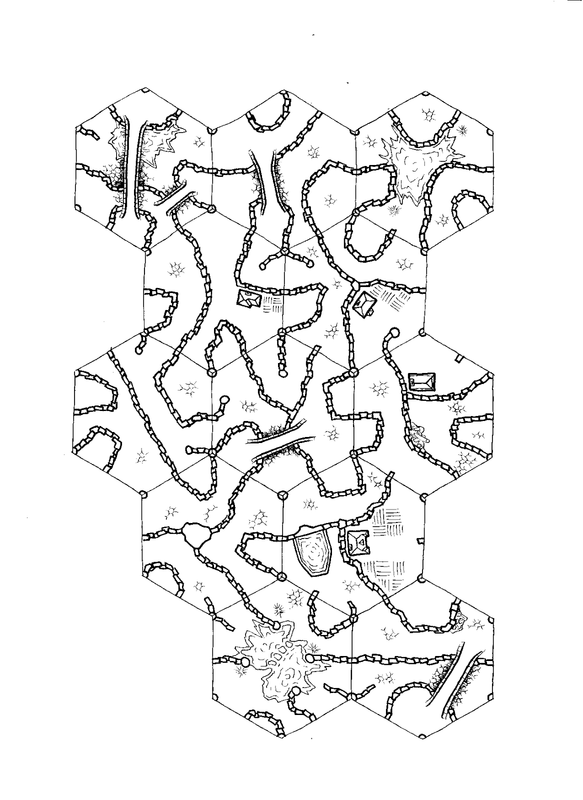 All you need are a few geomorphs that link the sets, and a couple of signature hexes to bring out key points of interest. Since there has been some strong interest in this series, I'll try to keep the inertia rolling with regular posts (despite the difficulties this poses). Thankyou for indulging me in this foray into miniatures and terrain for the past couple of weeks. The project has basically reached it's conclusion, and here is the final result. I'm pretty happy with the ways these have turned out. I could easily spend more time obsessing over finer details, but this stuff is meant for playing with. Finer details make people scared to play with stuff in case they damage it. Shortly we'll head back to our regularly scheduled programming with a return to the geomorph series. My Voidstone Chronicles project is steadily ticking away, a few people have taken an interest in it. But it was always designed to be an expanding world, which would be developed more as time went by. With that in mind I've spent a bit of time adding some new elements to the setting. The initial release saw five cultures (north, south, east, west and central), and four occupations (adept, disciple, hunter and warrior). But recent work has seen me develop a few new cultures and next I'll work on a few new occupations. One of the new cultures is an alternate central group. Where the existing group was comprised of high ranking nobles, this new cultural group ("The Triad of Central Syndicates") is a lower class criminal underworld. A second culture is a group that players may not start with, but instead a group that may be defected to during the course of play. These are nomadic outcasts on an endless pilgrimage of redemption. This piece of terrain isn't completely static. It has a few moving parts because I like my projects to have a little bit of something special about them. 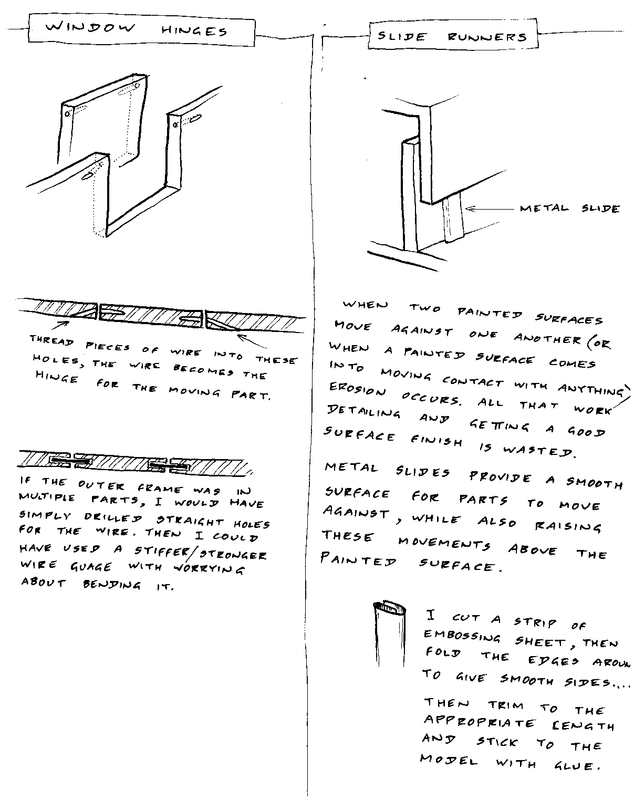 Here's a basic sketch about how I made those moving parts work. ...and a couple of photos. 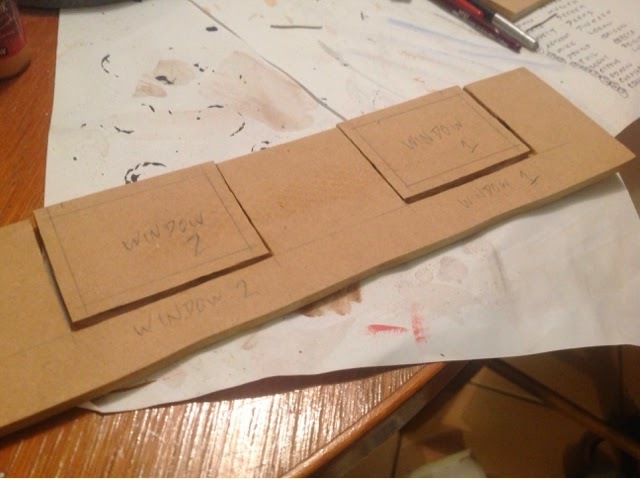 (There have been quite a few photos of the window progress over the course of the tutorial series). 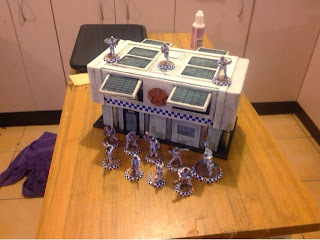 Using a lot of the painting techniques described during the "Miniature Painting" series, I've applied a bit of colour to the peacekeeper mobile outpost. Just a few more details to add, then we'll be ready to move on to the next project. The primer coat has been applied to most of the building, and the shafts representing hydraulic rams have been cut to size. Now that the primer has been applied, I can see where I really need to apply some extra care to get the right surface finish. The cracks in the corners will need to be filled with something (or maybe they could be highlighted to look like battle damage). 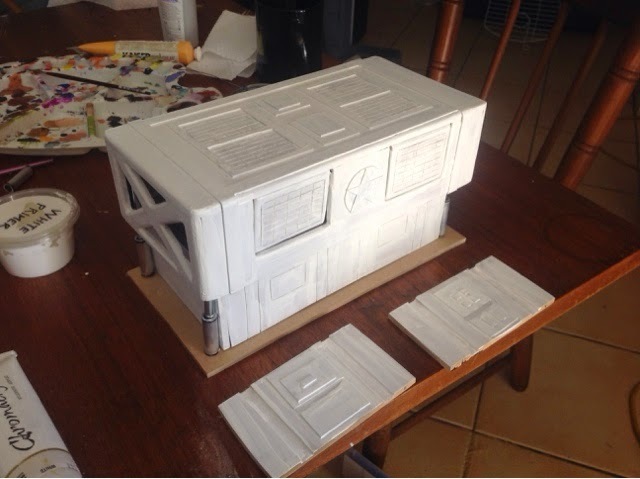 The two panels at the front are going to be painted before they get glued into the structure, because they'd be a bit tricky to access with a oaint brush once they're inside. Regarding the hydraulic rams, there are two distinct schools of thought. One states that all surfaces should be primed and painted to ensure consistency of surface finish across the model. 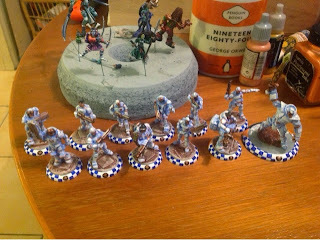 These are the kinds of people who often do incredible work with paint shafing to produce "non-metallic metal" effects (look up this technique on Cool-mini-or-not). Did I mention that I like textures? Depth, bumps, things for the brush to catch onto when drybrushing. I'm starting to think that the peacekeeper outpost is starting to develop a bit of an anime vibe with it's straight lines and rounded corners...not that this is a bad thing. But it's looking a little too clean and smooth. Perhaps if these things were dropped from orbit, that might be a good thing, but I'm thinking more of the original design when I see these outposts shipped by truck, helicopter and barge. It still needs to be relatively smooth, but can handle a few bits of relief work across its surface. To do that, I use cardboard. 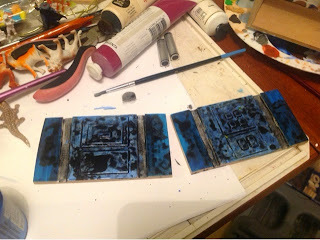 In this case I draw up a few strips, some rectangles of various sizes, circles and a star for each side of the structure (in keeping with the stars on certain figures and the stars I've drawn on the bases). These are cut out with a sharp knife. This is pretty much the entirety of Vulpinoid Studios at the moment. 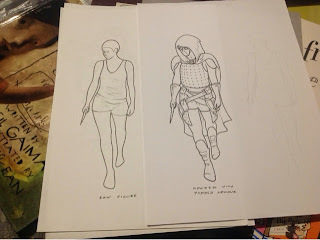 All of the files, all of the soft copies of game designs, except for those uploaded to this blog or RPGNow, and those that exist as hard copies (whether printed or handwritten). Time to start the process of rebuilding. 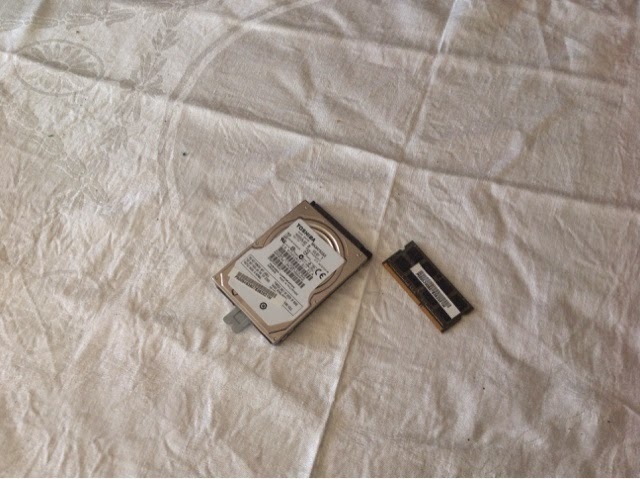 Now I just need to find something that can read old laptop hard drives. Well considered and well built terrain helps to tell the story of the world, in much the same way that a well painted figure tells the story of a character within that world. You may be wondering why I've written this. The simple reason is that once I put all the parts together, this is how well things lined up at the other end of the box assembly. In my attempt to sand things to the right size, I made some of the components too small, and the actual wall thickness of the material was closer to 5.5mm rather than the advertised 6mm. As a result, I'm about 2mm short on one end. It doesn't make a lot of difference in the grand scheme of things, I can always just sand down the lid to match these components. Luckily this isn't a functional bit of the design that needs close to.erances to work. At this stage we're still cutting out the shapes for the final piece. The basic rectangles for the box sides have been cut out, and now it's time for detailing the piece. That means windows, then etching designs into the sides. Instead of the heavy power tools, this cutting and etching is done with a hand-held rotary tool (my wife spent a decent amount of money on a variable speed Dremel with a huge range of attachments as a birthday present to me a few years ago). 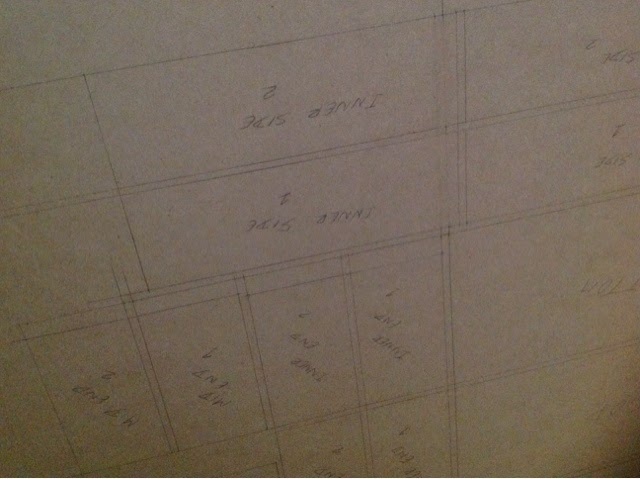 I still make sure to label all the pieces, just in case my cutting isn't straight and some windows don't match up with some holes, this means each window shutter will definitely fit, because it is marked to match the hole it was cut from. Now for some etching, because I like surface detail. A long way to go, but we're getting there. One of the key things about good terrain building is preparation. You need to know what the game system is, what mechanisms might come into effect, how figures are placed, what the setting is. Does the system allow figures to climb on buildings, or do they just run around on the one level? Are there rules for 'full cover' or 'partial cover'? Does the terrain need to accomodate different sizes of base? 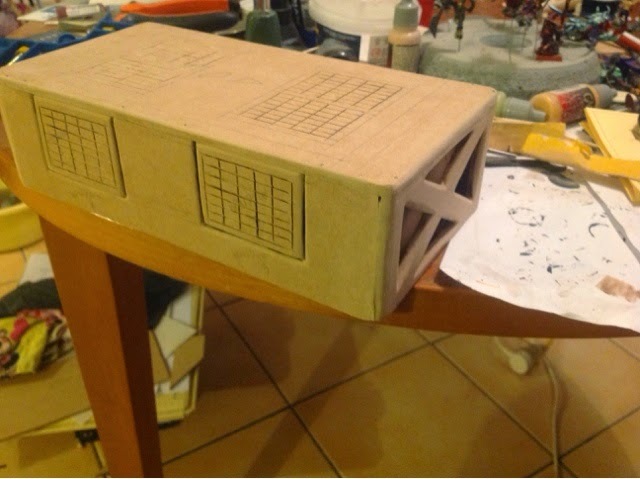 For this first project, I'm just making a simple rectangular box...okay, maybe it's not just a simple box, it's a figure carry case and it's retractable, so it needs a degree of sturdiness and versatility. But sturdiness and versatility are generally useful to keep in mind with any terrain project. Sturdiness because you want this stuff to last, you don't want to have to make new terrain for every game played. Versatility because you want to be able to mix and match the terrain in interesting ways.